In a world of unsustainable growth, disaffected workers, persistent gender inequalities and political upheaval, are traditional business schools still relevant? “Business schools were created in response to societal problems. 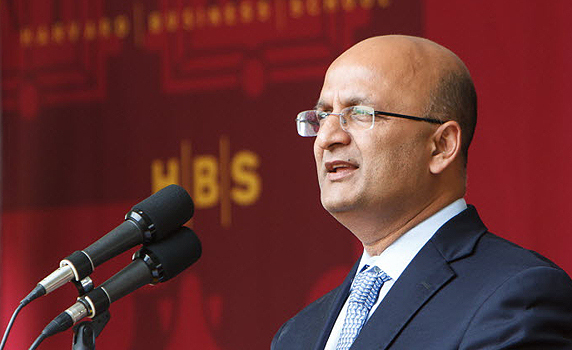 There is a new set of societal problems and we better apply our energies to solve them,” Harvard Business School (HBS) Dean Nitin Nohria said recently at an event on the Barcelona campus to mark the launch of IESE’s 60th anniversary celebrations. Nohria and IESE Dean Franz Heukamp discussed what business schools must do going forward to produce leaders capable of addressing these issues – in a context of technological change and new forms of learning. IESE and HBS have been partners since IESE’s earliest days. When the founders of IESE began imagining a new school for executives, they travelled around Europe to discover best practices and also sought the advice of Harvard, a forerunner in business education. The Harvard-IESE Committee was formed in 1963, and the close alliance continues to this day. But the world in which IESE was created is today a very different place. And while many global indicators – in areas such as health, government and living standards – are as strong as they’ve been in human history, there is also an urgent sense that we must do better by the planet and by the people who inhabit it. For both deans, businesses, and the well-trained people who create and run them, are a crucial part of the solution – but only if they are creative in proposing new approaches to employment, the gender gap and the company’s place in society. Current and future business leaders in advanced economies must address the failure to provide jobs and upward mobility to many workers, who now feel excluded from progress, they said. That failure in part gave rise to swelling populist political movements in the developed world – which in turn produce measures that only exacerbate problems. “Politics is not the solution to the problem,” Nohria said. Productivity in advanced economies must increase, so that jobs remain in local communities and employment options stay strong and varied. People with all levels of education – from high school diplomas to associate degrees to advanced studies – must have meaningful employment choices in their communities. “This problem requires our most creative imagination,” Nohria said. Investors, employees and consumers are increasingly rewarding companies with a sense of community and sustainability, and which show respect for the environment, endure over time and are concerned with their employees’ wellbeing. Gender equality is another pending moral and economic issue that managers must grapple with. The #MeToo movement has served as “a very painful reminder that even as we have increased numerically the number of women in the workforce, there is a long, long way to go,” Nohria said. For business schools, it starts at home, by ensuring that female students enjoy the same opportunities and rewards as their male counterparts. If schools themselves serve as examples of gender equality, graduates enter the workforce with the same expectations. Business schools can also do their part to promote research on gender issues such as the pay gap, opportunity imbalances and policies that penalize working mothers, Heukamp added. Change is imperative in the classroom as well, requiring the traditional MBA programs that have been the backbone of many business schools to adapt. Gone is the guarantee that a two-year degree earned early in your career prepares you for a lifetime of work. “I think that we as business schools have to get better prepared to be relevant and engaging and interesting to our students throughout their lives,” Nohria said. “We will have to go from episodic education to on-demand education,” he added. With people living and working longer than ever, learning must continue throughout their lives, in a wide variety of formats. Business education must also respond to the changing global realities. As countries such as China and India carry increasing weight in the global economy, they will produce their own world-class business schools. For Nohria, institutions such as HBS must approach the developing world “first and foremost with intellectual humility,” recognizing that their brand of management does not necessarily dominate. Rather, it is about training global leaders. “Our comparative advantage will come from being able to deliver great global education,” he said. What won’t change is the sort of general management approach HBS and IESE take, the deans said. “I feel quite optimistic that the value of management education, and in particular management education that puts an emphasis on judgment over skills, will increase over time,” Nohria said. The case method is part and parcel of that, because it walks students through the decision-making process and teaches them to make sound judgment. “It’s very hard to imagine any other method reproducing that,” he said. The case method also keeps the curriculum – and professors’ knowledge – current. As Heukamp pointed out, new combinations of classroom experience and online learning can help make the case method more, rather than less, relevant. “I think we use the case method better today than perhaps we did in the past,” Heukamp said.